Police had to be called in to control excited pilgrims who flocked to an Indian village to see a statute of Jesus Christ seeping 'holy water'. 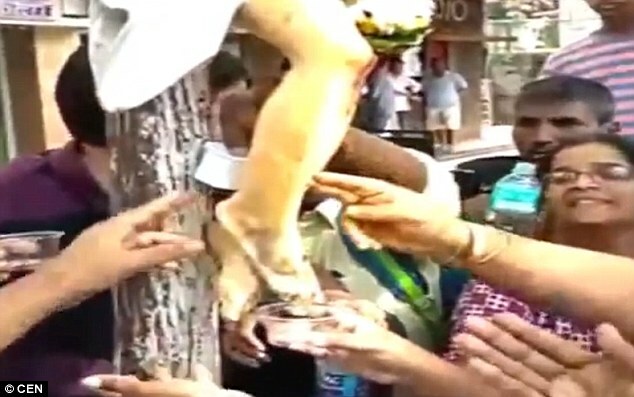 Believers gathered in Kharodi, near Mumbai, to collect fluid flowing off the figurine's feet. Words of the apparent miracle spread quickly after it was noticed by locals in the predominantly Catholic village. People collected the water to take away and use for its supposed healing properties. Greg Periera, a resident of nearby village Malwani, said people were travelling from miles away to witness the phenomenon.